Combine a steep bank with a house on top and a river at the bottom, and preventing erosion from rain and flooding becomes a major priority. This home just outside Louisville on the Ohio River was faced with just such a challenge in late 2010. Construction of the new house had already begun when Eric M. Goodman, R.L.A. was brought on site by the home owner to design a bank stabilization solution. Initially, he looked into using a small, modular block system. He quickly realized, though, that the amount of excavation required to reinforce the walls would undermine the house’s foundation. So, Goodman turned to Redi-Rock, a precast concrete system that uses massive, one-ton blocks to create gravity retaining wall solutions. “With the Redi-Rock system, the excavation behind the walls was minimized down to 8 feet (2.5 meters) or so and that saved a substantial amount of cost. 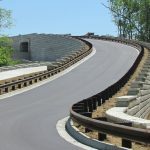 We would not have been able to make the project feasible otherwise,” Goodman said. Goodman was able to design a Redi-Rock solution that required no reinforcement at all. The owners were impressed with the design and agreed that Redi-Rock was the best solution for the project. They also had a choice in the aesthetics of the walls, as Redi-Rock is available in three different textures that give projects completely different looks-Limestone, Cobblestone, or Ledgestone. “The owners picked Ledgestone based on color preference, the shape of the stone, and the texture. The river banks have a sandy loam color and the Ledgestone wall blends in and doesn’t look so massive,” Goodman explained. The project is located within the conveyance zone of the Ohio River, so Goodman designed the walls to account for flooding as well. The walls were structurally designed with a curve to the upstream side so water and debris would arc around the wall and reduce bearing capacity during a flood event. Rip rap was also placed along the foundation of the lower wall to help minimize undermining. In addition to stabilizing the slope, Goodman also needed to create access to the beach. The grade change from the beach to the house was 30 vertical feet (9 meters), so hauling gear up and down the staircase for boating was a major chore they wanted to avoid. Creating a pathway that was accessible by motorized cart was a priority to the homeowners. “We somehow needed to go from 1:1 to 3:1, and also incorporate a cart path. We decided on a cross-slope design with circular landings so the cart would have room to park. We designed the top freestanding wall using Redi-Scapes to maximize the view of the river and offer a gathering space along with a fire pit,” said Goodman. 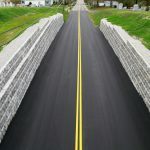 The design called for two tiers of Redi-Rock walls from local manufacturer Redi-Rock of Kentuckiana, with a Redi-Scapes freestanding wall on top.